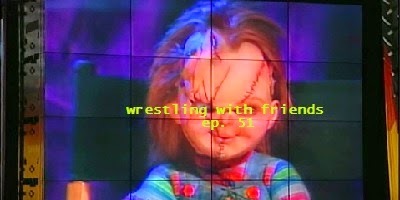 We're hoisting the red curtain for a special treat on this classic edition of Wrestling With Friends; an episode thought to be lost to the ages and to corrupted data files. Enjoy as the Friends don their makeup and costumes and put on another great show for you! This episode sees the Friends ready to dish out a new Judy Bagwell Award with the help from our first international judge (not object) to the show, Alex Klimkewicz! Alex has a hard docket to sort through on his first round of judging, between Big Show's ever-flowing tears, Howard Finkel's not-so-classic tuxedo/evening gown tussle with Lillian Garcia and an unwelcome visitor to Nitro in the form of Chucky. One Friend is willing to pull out all the stops to claim victory...whom will it be?? If you've missed the List, then have no fear: we're tumbling into the 50s for the first time with our #59 picks! As we head toward the mid-point, you can believe things are about to pick up. Get on board for this fun-filled episode...of fun! Final Song - Mancini, "Child's Play 2"